During the last two decades, remarkable and often spectacular progress has been made in the methodological and instrumental aspects of x–ray absorption and emission spectroscopy. This progress includes considerable technological improvements in the design and production of detectors especially with the development and expansion of large-scale synchrotron reactors All this has resulted in improved analytical performance and new applications, as well as in the perspective of a dramatic enhancement in the potential of x–ray based analysis techniques for the near future. 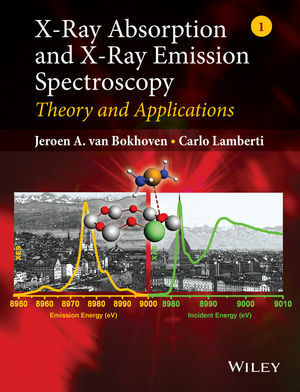 This comprehensive two-volume treatise features articles that explain the phenomena and describe examples of X–ray absorption and emission applications in several fields, including chemistry, biochemistry, catalysis, amorphous and liquid systems, synchrotron radiation, and surface phenomena. Contributors explain the underlying theory, how to set up X–ray absorption experiments, and how to analyze the details of the resulting spectra. Combines the theory, instrumentation and applications of x-ray absorption and emission spectroscopies which offer unique diagnostics to study almost any object in the Universe. Jeroen van Bokhoven has been an Associate Professor of Heterogeneous Catalysis in the Department of Chemistry and Applied Biology at ETH since 2010. He completed a degree in chemistry at Utrecht University in 1995 and went on to obtain a PhD in inorganic chemistry and catalysis in 2000. From 1999 until 2002 he was head of the XAS (X-ray absorption spectroscopy) users - support group at Utrecht University. In 2006 he obtained an SNF assistant professorship in the Department of Chemistry and Applied Biology. He was the 2008 recipient of the Swiss Chemical Society Werner Prize. Van Bokhoven works in the field of heterogeneous catalysis and (X-ray) spectroscopy. His main interests are heterogeneous catalysts and developing advanced tools in X-ray spectroscopy to study the catalyst structure under catalytic relevant conditions. Carlo Lamberti achieved his degree in Physics in 1988 with a thesis in the field of many body Physics. From 1988 to 1993 he worked in the CSELT laboratories Torino, on the characterization of the interfaces of semiconductor heterostructures with high resolution XRD and X-ray absorption spectroscopies. He presented his PhD defense in solid state physics on this topic in Rome in 1993. He was appointed to the position of researcher in October 1998 at the Department of Inorganic, Physical and Materials Chemistry of the Torino University, and as Associate Professor in December 2006. In recent years he has become an expert in the techniques based on Synchrotron Radiation and Neutrons beams in the characterization of materials, performing more than 90 experiments approved by international committees on the following large scale facilities. He has authored and co-authored more than 200 research articles and five book chapters and two books. He is member of the PhD School in Material Science of the Torino University, and is the Italian coordinator of the MaMaSELF European Master in Materials Science. 5.2.2 Can XAS solve the problem?